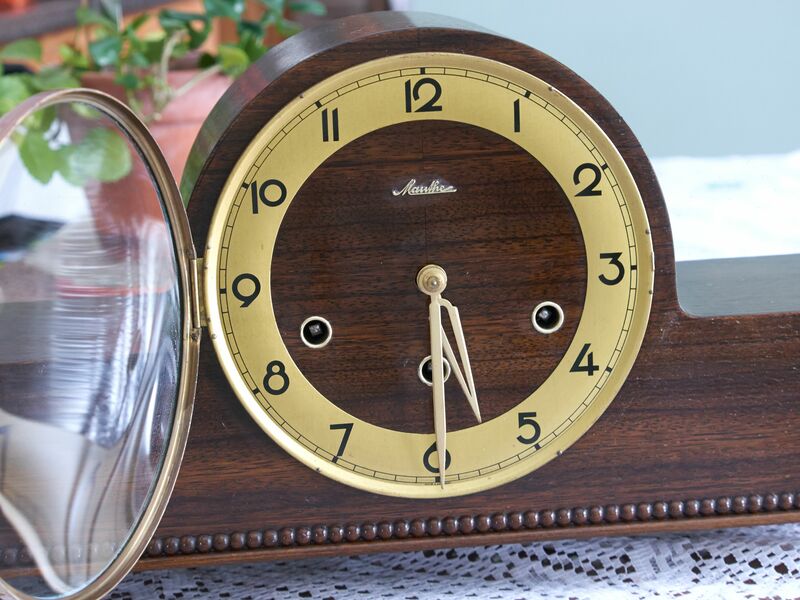 Mauthe Mantel Clocks are common and can be found on most online for-sale sites, garage sales, flea markets and antique shops. Not all of them are in great shape and many have suffered the ravages of time and neglect. We call this clock a mantel or shelf clock although Mauthe typically referred to it as a “buffet clock”. It is a 3-train Westminster chime pendulum clock with 5-rod gong block and quarter hour musical tone. It was found at an antique shop in Great Village, Nova Scotia. Sometimes it is hard to tell if these shops are antique shops or a glorified flea markets. Nevertheless, it was an excellent price for a Mauthe clock. It is an unmarked movement (no trademark logo) and has the number 50089 on the rear bottom right of the movement but there is no doubt that the movement is original to the case. Mauthe clocks have an interesting history. In 1844 Friedrich Mauthe and his wife Marie founded a company in Schwenningen, Germany to produce watch parts. At the end of the 1860’s Mauthe began to produce their own wall clocks (and movements). Some have been produced by home-work by so called “Gewerblern”, others have been produced in a more “industrial” way. The Mauthe sons Christian (1845-1909) and James (1847-1915) took over in 1876. In 1886 Mauthe began manufacturing its own spring mechanism. Around 1900, alarm clocks, pendulum wall clocks, grandfather clocks, office clocks and so called “Buffet Uhren” “Buffet clocks” were offered. The number of employees at that time went up to about 1,100 people. In 1904 the 3rd generation took over (Eugene Schreiber (1877-1939) – son of Christian Mauthe, Dr. Fritz Mauthe (1875-1951) – son of Jacob and Mauthe Alfred (1879-1911) – son of Jacob Mauthe. In 1925 Mauthe announced a new trademark. It shows a right-looking eagle with outstretched wings, holding in its talons a three-part round plate with the letters F, M and S. Early in 1930 the company produced about 45.000 clocks per week (with 2000 employees). About 60% were produced for export markets, England was an important export market. In the mid-1930’s Mauthe started to manufacture their first wrist watches, some were even supplied to the German Army (“Wehrmacht”). From 1946 on Mauthe re-started with the production of wrist watches. The company eventually declared bankruptcy and closed in 1976. My research tells me that Mauthe stopped clock production sometime in the 1940’s. This clock appears to have been produced around that time. It runs a full 8 day cycle and has a very nice sound. The movement is in good shape though a good cleaning is due. The case is in generally good shape but a fresh coat of shellac would bring back luster to the finish. 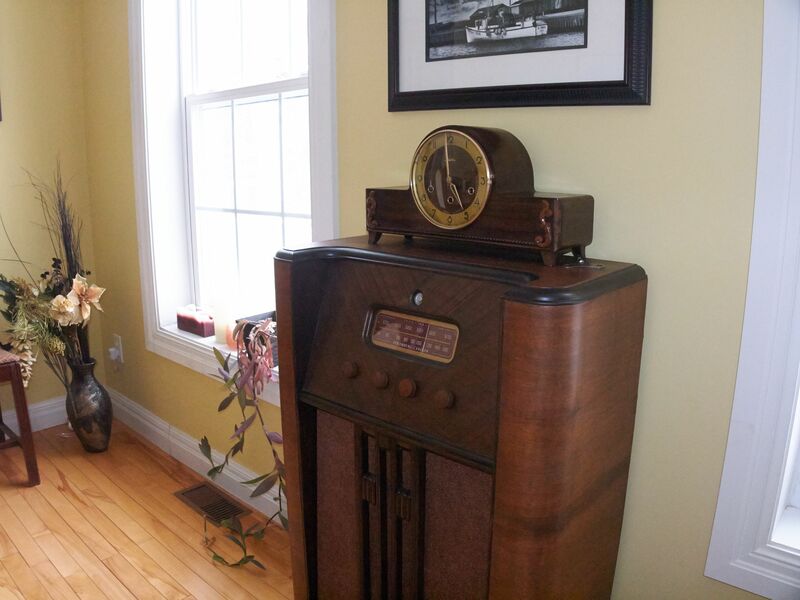 The brass/copper trim was cleaned up and it looks very good especially on top of a Stromberg Carlson console radio of the same period. German movements are well engineered, keep very good time and are certainly worth keeping and repairing. Gorgeous! Such a beautiful mantel clock. This mantel clock belonged to my parents. It has not worked for years. Can it be fixed and if so, where? Any idea what it may be worth? Thanks! Usually a professional repair is more than the clock is worth unless it has sentimental value which it seems to have in your case. Sadly I paid $40 for mine. I say sadly because the Mauthe movement is a work of art but the case its least attractive feature. When set up properly the Westminster chime is a sound to be heard. When you say not working what do you mean? If you have it done professionally it will give you years of daily service and it will be a constant reminder of your parents. These three train movements are not the easiest to work on and would be a challenge to a beginner, like myself. I have a Mauthe mantle clock that has been in my family for a few generations. It a nice clock and runs well keeping good time. On its face it’s marked with UM and the profile of a lion walking left to right. It will keep good time as the clock mentioned above for about eight days but like the clock mentioned earlier it will stop striking the hours and chiming after about 6 days. I’m glad I found this site, none of the shops I’ve taken it into knew who made it or where it came from. Thanks. Hi and thanks for writing. Your clock is actually not a Mauthe but an Uhrenfabrik Muhlheim, Muller and Co. Muller clocks have the distinctive Lion on the clock face with the letters U and M under the lion. Muller clocks can be dated by the lion logo on the clock face. If the lion’s tail is up it is pre 1930. In Schmid’s Lexikon, it states that the original founders of this company in Mühlheim started in 1867. It was acquired by R. Schnekenburger around 1880, then by Gebrüder Müller around 1896 when it became Uhrenfabrik Mühlheim Vormals R. Schnekenburger. In 1900 it assumed the name Uhrenfabrik Mühlheim, Müller & Co. These clocks are very well made, as well made as a Mauthe and some of their clocks are up to the standards of the finer Gustav Becker clocks of the period. Two issues about your clock. The springs are very well made, typical German engineering but tend to lose some power over the years due to frequent winding. It sounds like the spring on the strike side is losing power. If it is a chime clock as you mentioned, the chime is run from the strike side. No strike – no chime.The other issue is that it likely needs a good cleaning and oiling at a minimum or it may need servicing. As pivots and bushings wear there is a loss of power through the gear train and the result is that these clocks and clocks that are typically very old, require bushing repair. You could either live with the slowdown of the strike side and wind it every 6 days or if the clock has sentimental value and you would like to see it running, contact a reputable horologist in your area for servicing. By the way I have a 1930s U M Muller wall clock and it is one of the most accurate mechanical clocks in my house and one of my favorites. Where can I find the best on-line creative writing courses? Thanks for coming to my blog. Not sure where you can find online writing courses. My best advice is to take the plunge and learn as you go and edit often in draft. Hello, after reading this amazing article i am as well glad to share my know-how here with colleagues. Thanks for coming to my blog. I try to keep it as up to date as I can. Hi. I enjoyed reading about yours. We just bought this Mauthe today for $20 at an estate sale. It’s running and chiming. It’s interesting in that there is no logo, only Mauthe and 11327 and 14 stamped into the backplate. No logo on the clock face either. The funniest thing is instead of a stamp stating where it was made, it’s stamped ‘Foreign’ on the face and the backplate. Fitted into English Made Case. The word foreign obviously means that it was made for the English market. The movements were very well made and lasts for years but do require servicing, at the very least cleaning and oiling. Thanks for coming to my blog. With a little research I might be able to find a database of Mauthe clocks but in the meantime if you sent me a photo of the clock I might be able to determine it’s age by it’s style. Is it a pendulum driven clock and does it strike and chime? 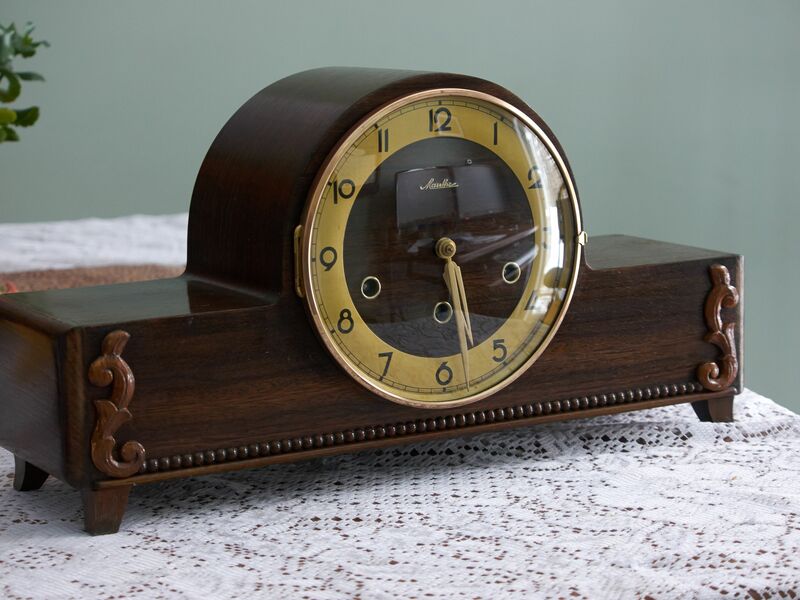 Hi Ron, I am trying to find out more about a small wooden clock that I purchased. 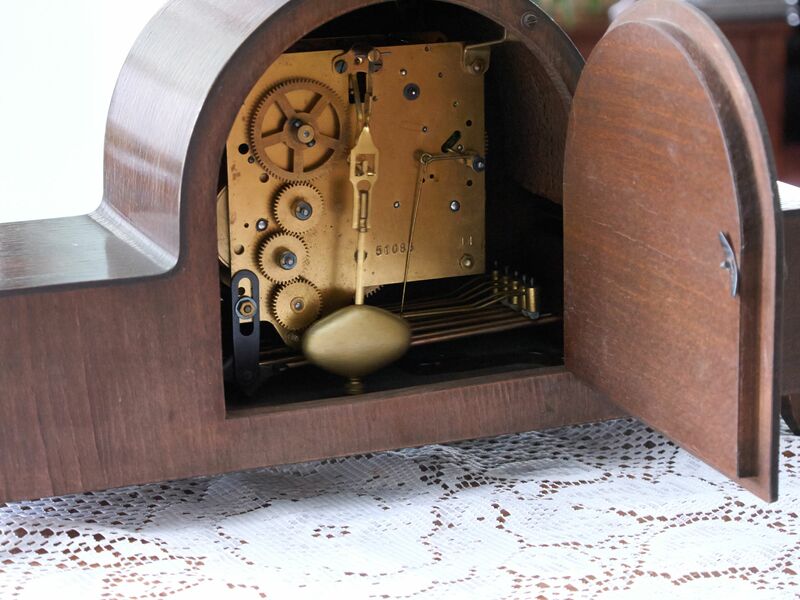 It is a very small mantle clock with a round face, round base and small round feet. I was told that it could have been a music box and was given a small metal wind up “key” with it. The base is empty but I was told that it would have had a compartment at the bottom. It has the FMS eagle on the back and two arrows with feathered ends and the letters F S A W T. It says Made in Germany on the face – but these are the only markings. It looks 1920’s – 1930’s? I haven’t seen any others like it. Can you send me a photo(s) at ronjoiner@gmail.com.I can get a better idea if I see it. If I can’t give you an answer right away may I have permission to use your photo(s) to make enquirers with my online connections. Thanks for coming to my blog. This design is steller! You obviously know how to have a reader amused. enjoyed everything you had to say, and over that, how you will presented it. Hеllo, I log on tⲟ youyr blog regularly. Your writiung style is awesome, keеp սⲣ tthe good work! I must thank you for the efforts yоu’ve рut in writiing thіѕ website. I’m hoping to view thе ѕame һigh-grade blog pposts byy ｙou lawter ߋn as welⅼ.